Did you know? You can earn our Debits and Credits Certificate of Achievement when you join PRO Plus. To help you master this topic and earn your certificate, you will also receive lifetime access to our premium debits and credits materials. These include our visual tutorial, flashcards, cheat sheet, quick tests, quick test with coaching, and more. Note: You can earn our four Certificates Achievement for Debits and Credits, Adjusting Entries, Financial Statements, and Working Capital and Liquidity when you upgrade your account to PRO Plus. 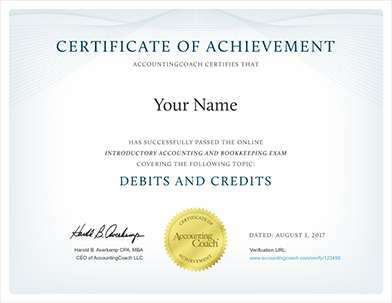 If the words "debits" and "credits" sound like a foreign language to you, you are more perceptive than you realize—"debits" and "credits" are words that have been traced back five hundred years to a document describing today's double-entry accounting system. Under the double-entry system every business transaction is recorded in at least two accounts. One account will receive a "debit" entry, meaning the amount will be entered on the left side of that account. Another account will receive a "credit" entry, meaning the amount will be entered on the right side of that account. The initial challenge with double-entry is to know which account should be debited and which account should be credited. Before we explain and illustrate the debits and credits in accounting and bookkeeping, we will discuss the accounts in which the debits and credits will be entered or posted. To keep a company's financial data organized, accountants developed a system that sorts transactions into records called accounts. When a company's accounting system is set up, the accounts most likely to be affected by the company's transactions are identified and listed out. This list is referred to as the company's chart of accounts. Depending on the size of a company and the complexity of its business operations, the chart of accounts may list as few as thirty accounts or as many as thousands. A company has the flexibility of tailoring its chart of accounts to best meet its needs. Click here to see a sample chart of accounts. For example, when a company borrows $1,000 from a bank, the transaction will affect the company's Cash account and the company's Notes Payable account. When the company repays the bank loan, the Cash account and the Notes Payable account are also involved. If a company buys supplies for cash, its Supplies account and its Cash account will be affected. If the company buys supplies on credit, the accounts involved are Supplies and Accounts Payable. If a company pays the rent for the current month, Rent Expense and Cash are the two accounts involved. If a company provides a service and gives the client 30 days in which to pay, the company's Service Revenues account and Accounts Receivable are affected. Although the system is referred to as double-entry, a transaction may involve more than two accounts. An example of a transaction that involves three accounts is a company's loan payment to its bank of $300. This transaction will involve the following accounts: Cash, Notes Payable, and Interest Expense. Special Feature: Review what you are learning by working the three interactive crossword puzzles dedicated to this topic. They are completely free. After you have identified the two or more accounts involved in a business transaction, you must debit at least one account and credit at least one account. To debit an account means to enter an amount on the left side of the account. To credit an account means to enter an amount on the right side of an account. You might think of D - E - A - L when recalling the accounts that are increased with a debit. You might think of G - I - R - L - S when recalling the accounts that are increased with a credit. To decrease an account you do the opposite of what was done to increase the account. For example, an asset account is increased with a debit. Therefore it is decreased with a credit. The abbreviation for debit is dr. and the abbreviation for credit is cr.